That little tree, with its branch weighed down by the one red ornament… It’s just not Christmas time until I watch A Charlie Brown Christmas. This year we have been working on a mini Christmas unit in homeschool. 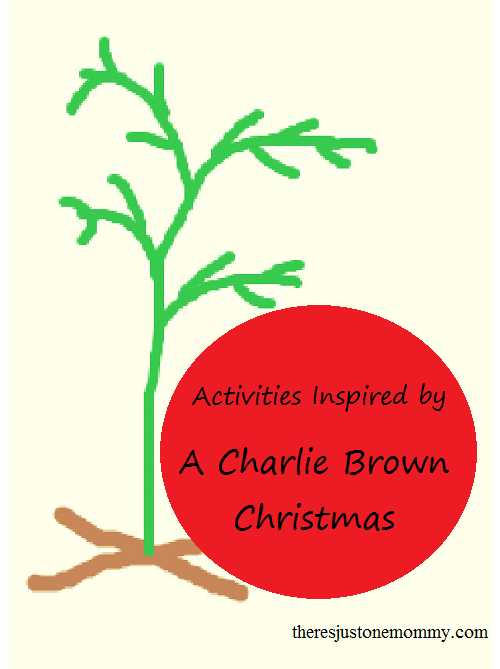 We had lots of fun with activities inspired by A Charlie Brown Christmas. We actually have a 30 year-old copy of the book. (You know, one of those that had a record with it back in the day that you could listen to and turn the pages when you heard the beep.) The kids have seen A Charlie Brown Christmas special on t.v. before, but this year I dusted of the book and we delved into its dog-eared pages. Before we started reading A Charlie Brown Christmas, I pointed out how the text is different from the typical books we read. We talked about how it was written as a play, with the character’s name followed by a colon and then the words they say. We compared the text to a few other story books we had nearby that make use of the typical quotation marks. Then it was time for some math. 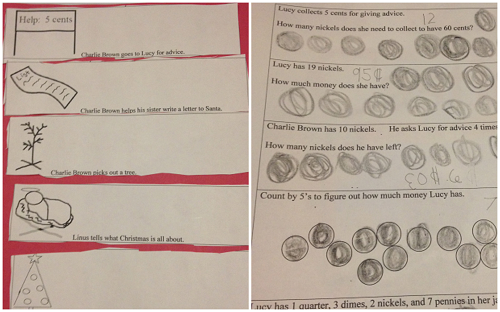 Practice counting by 5’s since Lucy charges 5 cents at her help booth. Charlie Brown picked a small tree for the play. Use your tape measure to determine how tall your Christmas tree is. While you’re at it measure a few ornaments! Print out our Charlie Brown Christmas math sheet for more math problems inspired by the Peanuts gang. While reading the book or watching the video, use the opportunity to talk about the characters and how they feel. In the beginning of the story, when Charlie Brown finds out Snoopy has entered the decorating contest and then he helps his sister write her Santa letter, how does he feel? How do you think Charlie Brown feels when the kids make fun of the tree he chose? Speaking of that little tree, it is a great opportunity to introduce symbolism. There are many things the little tree could symbolize, including the fact that Christmas trees are a traditional symbol of the holiday. I love the quote from Linus, “I never thought it was such a bad little tree. It’s not bad at all, really. Maybe it just needs a little love.” We talked about how none of us is perfect; we are all a little like Charlie Brown’s tree. I took it a step further and introduced the idea that God loves us, no matter how imperfect we are. In fact, that first Christmas gift of Jesus was really a gift of love to us all, just like the little tree needed some love to shine its brightest, God’s love makes us better, too. We decided to make our own Charlie Brown Christmas tree to remind us of that love. Cut the craft stick in to 2 one inch pieces to make the tree’s base. Cut one pipe cleaner in half and bend the top a bit for the main part of the tree. Twist 2 inch pieces of the other pipe cleaner around it to form branches. Hot glue a red bead on and add a bit of ribbon or cord to hang it. The little bent tree with the red ornament on it may just be one of my favorite homemade ornaments. It definitely feels more like Christmas here now. 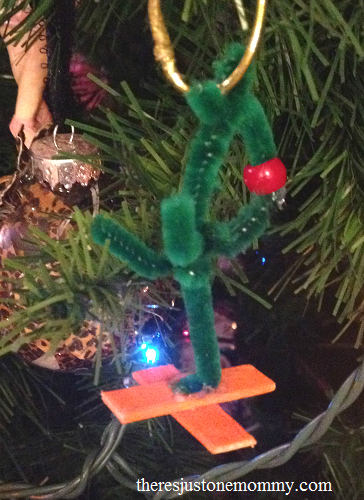 My favorite part is where you made your own Charlie Brown Christmas Tree ornament. What a great way for you all to remember this every year! Mind blown. What awesome symbolism there! Now I need to watch it again!